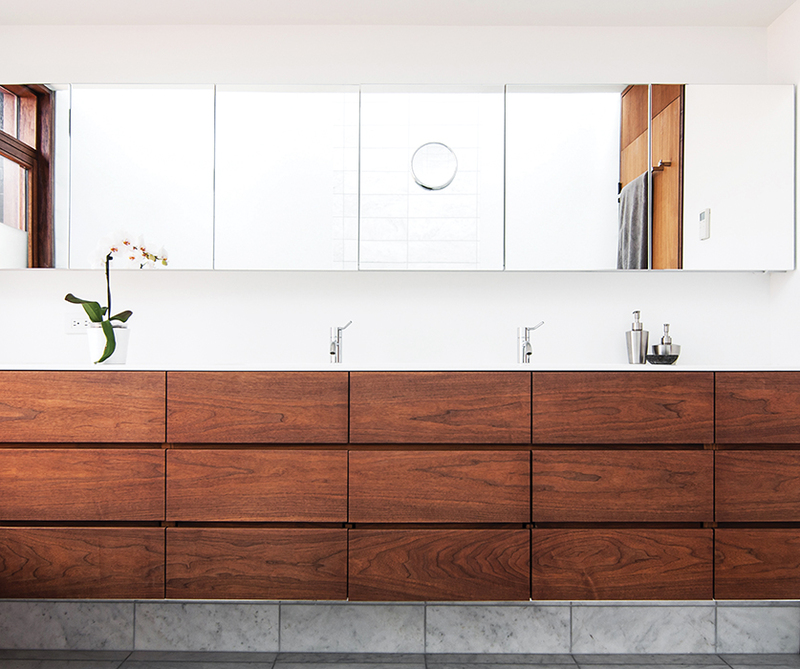 Architect Paul Syme designed custom storage units with dark-stained walnut fronts that provide a place for everything in his clients’ Toronto bathroom. The wall-to-wall mirror and the Corian counter are custom, and the faucets are by Vola. The bathtub faces a Spanish-cedar-framed window overlooking the back deck. Once the outside plants have grown up enough to provide privacy, the adhesive film on the window will be removed. The standing shower is set off by etched-glass panels supported by stainless-steel hardware. There is no threshold; instead, the tile within the shower zone slopes down very slightly to a floor trough with a custom stainless-steel grille. Along the wall, a Corian shelf—“the longest soap dish in the world,” resident Don Evans jokes—runs the length of the space. In the rear of the house, a new addition extends the living space and adds a roof terrace off the second-floor master bedroom. A garden is accessible through a wall of sliding glass doors with Sapele mahogany frames, set back to control solar gain. Windows in the roof monitor let in natural light and ventilation. A slight gap between the existing house and the new addition allows for a skylight and a masonry chimney with a wood-burning fireplace. The transformed facade features dark gray stained-masonry.